In this first of what will be a long series of podcasts arising from the 2013 Comics & Medicine conference, we hear Paul Gravett‘s rundown of Graphic Medicine work that has come to his attention in the past year. His talk is titled, Frames of Mind: Reflections on Medicine in Comics: An Introductory overview of the past, present, and future. Most of the titles he discusses in his talk, and ones recommended by the conference audience, are linked in this earlier blog post. 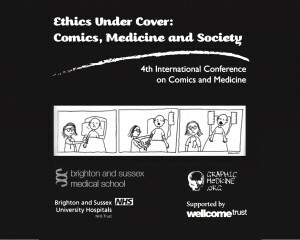 Before Paul begins, conference organizer and comics creator Muna AlJawad welcomes us to Brighton, followed by fellow organizer, Brighton Sussex Medical School ethics professor Bobbie Farsides (@ethicsbird on Twitter) discusses the theme of the conference, Ethics Under Cover.